This is the first of two Perfect Picture Books today. What a clever idea. The more I read your description, the more I wanted this book. I also thought — I’m so happy this pitch got into the hands of someone who loves Broadway. sounds perfect for any theater interested kid. Yes, it is. I wish I’d had it when I was a kid! What a great book! Wish they had books like this when I was a young child. I loved acting and the theater in elementary school and would have read it over and over. Great selection. Like your resources. You and me both, Pat! Oh, wow. First, we love Harriett Ziefert. We have so many of her books. I can’t wait to check out her clever take on theater. My boys go to theater shows for children periodically, so this should make a delightful read. Oh, this will be such fun for them. Be sure to tune in to my blog next week, too, when Jennifer Kirkeby tells about adapting Llama, Llama, Red Pajama for the stage. You’re right, Vivian. It would be a great way to coax that “inner performer” out of hiding. It certainly presents theatre in a fun way. Oh this is perfect for my daughter! She is 7 and talks non-stop about being in the school play next year. Looking forward to checking this out for her. Thanks, Beth! What an interesting-sounding book on a topic that might be of much interest to lots of kids! It sounds very educational – I’m sure I could learn a lot. Thanks so much for sharing this one – we have a few on art and music, but not so many on acting. I’m glad to be adding this one! This book sounds so interesting! The quotations mixed in with the definitions is a clever idea. Thank you, Beth. Thanks, Heather. There’s all kinds of tidbits both in the text and the illustrations. Sounds so unique. I love the idea of an ABC for older kids. Clever! It intrigued me right away, and it was quite delightful. THis is a really neat PPB! I like how the cover illustration is done. I like that it comes with a CD and explains some of the words used in theater. I think you’d find this book a really fun way to learn about the theater, Erik. Thanks! 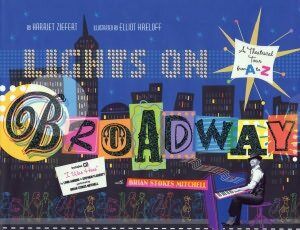 This eyecatching book looks a winner for kids interested in stage/theater. Your comment to Susanna even more interesting.